FDR State Park is Georgia’s largest state park, so it should be no surprise that it is filled with things to do! This park has it all: hiking, swimming, fishing, boating, beautiful views, camping, cabins, history, presidential love, and many unique events. My family has been coming here for 35 years, and we still haven’t done everything there is to do! F.D. Roosevelt State Park is surprising, as I don’t think many people expect mountain views in this part of Georgia. This 9,046 acre park is located about 80 miles southwest of Atlanta. This area is beautiful, and not only do I think so, but President F.D. Roosevelt thought so, too! He began coming to the area in 1924 to find relief from his polio in the nearby warm springs, and he is a big reason it is such a beloved and treasured place today. The nearby Little White House is also an amazing and unique place to visit and learn more about the man who loved this land. There is so much to see, do and experience in this massive state park! Here are 25 wonderful ways to explore the area that FDR loved. 1. Stay in a cabin built by the CCC. One of the best ways to experience FDR State Park is spending the night in one of their 22 cottages. The park has cottages that can accommodate anywhere from 2 to 10 people, and two of their cottages are pet-friendly. Some of the cabins are located along Lake Delanor, and some (including the pet-friendly cabins) are near the Delano Trail. One of the neatest experiences is staying in one of the cabins that was built by the Civilian Conservation Corps during the Great Depression. Cabins 1-11 were built by the CCC, and all have a feeling of history that cannot be matched. Truly a wonderful experience. 2. Camp! My husband still likes to tell the story of our first married camping trip, in which we couldn’t agree on which awesome site to choose at FDR State Park. By the time we did agree, it was raining. Ha! Oh, memories! This park has 140 campsites, 16 backcountry sites, and one group site that has a capacity for 75 people! Some of the park’s 140 campsites sit along the beautiful 15-acre Lake Delanor. To get a lakeside site, I’d recommend checking in to set up as soon as possible, as the reservations are for a spot, but the spot you pick is first come first serve. My husband and I would also recommend not wasting time arguing over a spot. They’re all good, promise! 3. Hike the Pine Mountain Trail. The Pine Mountain Trail is a hiker’s dream! This is a popular 23-mile trail, and is awesomely well-maintained by the Pine Mountain Trail Association. They have several loops along the trail, which are great for day trips! Even with small children, we’ve managed to take in some of the sites along the PMT. With our kids, we’ve hiked a part of it near the main office, and we’ve hiked part of it from the “No Name Parking Lot” across from cabin 5’s driveway. There is so much of the trail to explore, so we try something new every visit! 4. Geocache. Let’s cut to the chase: my kids usually only sort of like geocaching. We don’t understand it, but they’re kind of “meh” about it generally. But then we took them geocaching at FDR State Park, their view on it has totally changed. The gist is this: Geocaching with littles here is the best. There is a FDR State Park-sponsored geocache hidden off the Pine Mountain Trail near the main office, that is a fantastic kid-friendly hike. It offers some cool views and some rock outcroppings that will give you a heart attack if you have fearless little ones. This hike was easy enough for my 6-year-old and 4-year-old, but it felt like a big hike. And the reward of the geocache was awesome. We’ve also geocached off the Pine Mountain Trail near Dowdell’s Knob – a great way to explore more of that area! But the absolute best is the series of geocaches along the Mountain Creek Trail Loop from “No Name Parking Lot” across from cabin 5’s driveway. I cannot say enough good things about it. My kids think the only thing better than finding one geocache in the woods, is finding five, and that’s exactly what you’ll get here. This trail is awesome and kid-friendly, with lots of neat things to explore, and the geocaches placed so your kids have a reason to keep going. Highly recommend this fun experience for anyone, and especially for those interested in converting their children into geocaching fiends. 5. Swim in the Liberty Bell Pool. The Liberty Bell Pool – named for its bell shape — is a spring-fed seasonal pool that was also built by the CCC. I think the coolest thing about this pool is that it was made with local stones – I guarantee you’ve never seen anything like it! The pool offers clean changing rooms, a nearby playground, and picnic tables. Throughout the summer the facility hosts events, and offers swim lessons. The pool is open from Memorial Day weekend through Labor Day weekend, and costs a small fee daily fee in addition to the Georgia State Parks parking fee, but it is so worth it. 6. Visit the park office. I love the park office. I know that’s a weird thing to admit, but I do. First, the building is historical — it was built by the CCC in 1938 using native rocks, and had a former life as an inn and a restaurant. I mean, you get a history lesson upon arrival! And then if you walk around the back, the views are amazingly beautiful. Right away, you’ll be happy you’ve come. It has a stone amphitheater next to it, which also hosts beautiful views, and occasional events. This is one park office that you should get out and explore. 7. Visit Dowdell’s Knob. I have a slight obsession with the Dowdell’s Knob area of FDR State Park, and rightfully so – it’s really neat. Dowdell’s Knob was one of FDR’s favorite spots. It’s said he came to this area for quiet contemplation, and I believe it. This area overlooks the Pine Mountain Valley, and it is the most peaceful spot. A statue of F.D. Roosevelt overlooks the valley, and my kids visit him every trip. FDR had many picnics here, and a grill he had built for that purpose still stands. There are picnic tables here, and access to the Pine Mountain Trail as well. I love this place. And hey, if it’s good enough for FDR, it’s good enough for me. 8. Take a selfie with FDR’s statue. FDR’s statue is located at Dowdell’s Knob and man, is he popular! My kids love him. They just call him “the President” and he’s totally okay with them climbing all over him. He also allows selfies, so snuggle up and snap! 9. Hike to a plane crash site. From Dowdell’s Knob, you can hike a short trail off the Pine Mountain Trail to a plaque and memorial rock that remembers the five victims and one survivor of a 1953 plane crash. The plaque and rock were placed there in 2012, and memorializes the place where a B-25 plane crashed into the side of Pine Mountain on a rainy October night over 60 years ago. Our kids were enormously fascinated with this area and the history behind it. 10. Visit the Little White House. FDR built the Little White House while he was still governor of New York in 1932, and continued to visit throughout his presidency until his death in 1945. FDR found that swimming in the warm natural springs brought him great relief from his polio, and that’s one of the reasons he loved this area so much. Now Roosevelt’s Little White House is a historic site and museum, and visitors can tour his home that has been meticulously preserved. One of the more unique offerings at the museum is the “Unfinished Portrait” – the portrait FDR was posing for when he suffered a stroke and later passed away. The Little White House, and the museums, are a must-see. 11. Take part in the First-Time Camper program. Camping seems like fun, but you’re not so sure you’re ready to invest money in something you’ve never even tried before? Then the First-Time Camper program at FDR State Park is for you! The First-Time Camper program is a Georgia State Parks program offered at 12 state parks – including FDR – where they let you borrow the gear, and they help you set it up! The park provides you with a tent, sleeping pads, lantern, camping stove, roasting forks, and camping chairs – you provide the enthusiasm, sleeping bags, and pillows. Regular camping rates apply, but there’s no extra charge for program. And hey, they even give you an emergency contact number to call if you need help during the night – so they’ve got you covered! 12. Go fishing in the lake built by the CCC. Lake Delanor is a 15-acre lake that divides the camping sites from the cabins. Some of the camping sites and cabins are right on the lake, so those sites make it extra easy to cast your line. The Civilian Conservation Corps built this lake, and after years of visiting this lake I just now realized that its name comes from combination of the Roosevelts’ names — Delano and Eleanor. The lake has bass, catfish, and crappie, and Georgia State Fishing license rules apply. 13. Go horseback riding. Roosevelt Riding Stables is located inside FDR State Park and offers different guided trail tours that range from 1 hour to half a day. You can ride alongside an old wagon trail, go past spring-fed creeks, or ride up to the top of the mountain, depending on which trail ride you choose! They even have geocaches along some of their trails (make sure you tell them of your interest in advance). And if you’re a horse owner, you can bring your own horse to explore the more than 20 miles of equestrian trails within the park. Fees apply, and reservations are recommended for the guided tours. 14. Check out the views from the scenic overlooks. Within the park, on your way to Dowdell’s Knob or into town, I highly recommend stopping at the scenic overlooks along the way. They are well-maintained, and have beautiful far-reaching views of the Pine Mountain Valley below. My kids love exploring these little areas, and I know there are some geocaches around some of them as well. 15. Visit the town of Pine Mountain. You could not pick a more beautiful nearby town than Pine Mountain! My parents often join us on our FDR State Park camping trips, and they include a visit to town every time. Pine Mountain is home to cute antique shops, and awesome local restaurants. My parents make sure to stop by Rose Cottage for lunch anytime they are in the area. And if you forget any major camping supplies while at FDR, they’ve got a grocery store only 5 minutes down the road. 16. Rent a boat. You can rent single- or double-kayaks, canoes, or aqua cycles from the park office and explore Lake Delanor from the water! They offer hourly, half-day and full day rentals, and your rental includes the required life jackets. Don’t jump in, though – no swimming is allowed! 17. Camp with your horse. Want to go camping with your favorite equine friend? You can! FDR State Park offers camping with your horse. You can reserve a primitive campsite with a high line for $10, or a primitive campsite with a stall and a bag of shavings for $32. I mean, you’d be basically living the cowboy/cowgirl dream! 18. Complete the 400-mile challenge. Let’s sing: “But I would walk 400 miles…” Okay, now that we’ve sung our slightly-altered version of the song, let’s do it! The 400-mile challenge asks you to walk, hike, run, or bike 400 miles inside of FDR State Park in a year. It’s based on the honor system, and once you register, the park will send you an email link so you can record your mileage throughout the year. After you’ve completed the challenge, you receive a certificate and a T-shirt! And if you finish the 400 miles before your year is up, you can keep going! And then you can sing, “But I would walk 500 miles…” and we would all know it was true. Separate fee applies. 19. Become a Junior Ranger. I think the Junior Ranger Program offered by the Georgia State Parks system is one of the coolest activities for kids out there. Free Junior Ranger activity books are available at every Georgia State Park, and children between the ages of 6-12 can earn badges once they complete the requirements. It’s a really neat and fun way to get out and explore FDR State Park, and your kids will love the feeling of accomplishment! 20. Eat at The Country Kitchen. The Country Kitchen gets its own spot because it is that neat. It’s a Callaway Gardens restaurant, but it’s not inside the gardens, instead located just down the road from FDR State Park. It serves breakfast, lunch, and dinner, so it’s a nice respite from cooking over a campfire. And the best part of this restaurant is the spectacular views! They have huge windows that overlook the beautiful valley. There is also a country store inside the restaurant that sells many local goods. The Country Kitchen doesn’t accept reservations, and can definitely get busy during popular times/seasons, so arrive early! 21. Participate in the Campground Halloween Adventure. I think camping during Halloween-time would be beyond awesome, and the only thing that could make it better has to be FDR State Park’s annual Campground Halloween Adventure! Held the Saturday before Halloween, prizes are awarded for best decorated campsite, and there’s campsite trick-or-treating once it gets dark. They also hold a pumpkin decorating contest, and you can pumpkin bowl for prizes. How fun would this be? 22. Participate in the Easter Egg Roll and Egg Hunt at the Little White House. Let your kids participate in an Easter Egg hunt at the (Little) White House! Held the Saturday before Easter Sunday, this popular annual event lets kids hunt for eggs on the Little White House lawn. And after all age groups have gotten their fill of eggs, kids can participate in the authentic Easter Egg Roll – just like they do at the White House in Washington, DC! Extra fee required. 23. Add a photo of your veteran to an Honor Tree at the Little White House. I think this is the most beautiful way to honor our much beloved veterans during the holiday season. Guests are invited to hang 3×5 pictures of their loved ones — who have served or are serving in our nation’s armed forces — onto three “honor” trees. The trees will be placed in the museum at the Little White House throughout the holiday season in December. You can write a message on the back of your photo, and strings are provided for hanging. Please only bring copies of your pictures, as the photos cannot be returned. 24. Let your dog swim in the Liberty Bell Pool at the end of the season. FDR State Park hosts a dog swim and luau at the Liberty Bell Pool every year. This annual event invites our best friends to take a turn in the pool for the day! Offered for one Saturday in September, it’s a day just for our furry friends, and they get to participate in a variety of contests: best swimsuit, best trick, best splash, DOGGIE LIMBO. I mean, could there be anything better?! It costs $8 for your dog to participate, and humans can’t get in the pool that day. 25. Dance on the mountain. I’m imagining it going like this — Friend: “What are you doing this weekend?” You: “Oh, I’m going to a dancing sing-a-long on a mountain!” And you win at life. This annual event is held on an October Saturday, and involves dancing and singing in the stone amphitheater next to the FDR State Park office on top of a mountain. You’ll be singing and dancing along with local musicians to music from the 60s and 70s and that’s just cool. The event is free, $5 state park parking fee required. BONUS! : Nearby attractions. One of the greatest things about the location of FDR State Park is that it is so close to a couple of awesome attractions. Callaway Gardens is just a 5-minute drive away. Callaway is home to beautiful gardens, excellent golfing, and has many special events throughout the year, including an amazing Christmas lights display. And Wild Animal Safari is also nearby, and allows guests the chance to get up close to some amazing animals — or them the change to get close to you. So after you’re done exploring the park, you can get out and explore more of the area! Have fun! 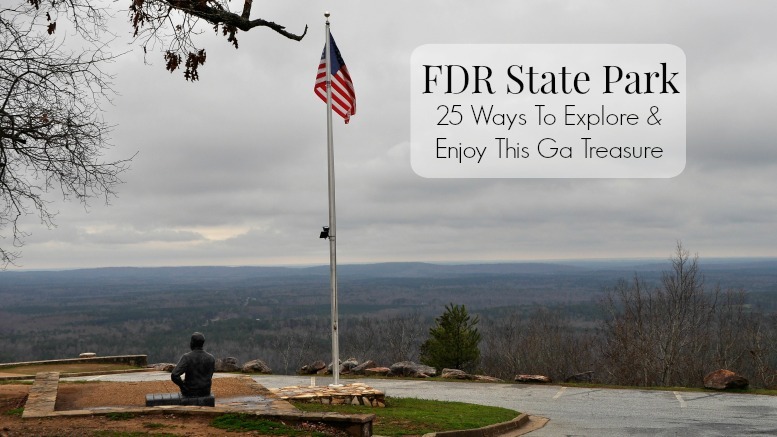 3 Comments on "FDR State Park: 25 Ways To Explore & Enjoy This Ga Treasure"
We just had a family reunion at FDR State Park and it was great. There were 43 of us there, most for the weekend. The park is beautiful as are the cabins. This was a very special reunion as cousins met for the first time and I got to hug and kiss my oldest granddaughter (age 35) for the first time. Couldn’t have ask for a better place for this event. Folks came from California, Washington State, Oregon, Florida, North Carolina and Texas, and of course Georgia. Only (gray water) hookup. Bathrooms ARE very clean! But don’t come for the fishing. Four of us fished for two days (various times throughout the day) – not do much as a bite.